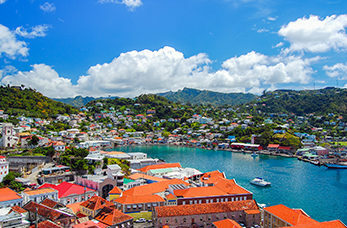 Known as the "Isle of Spice" Grenada is an island country consisting of itself and six smaller islands. It's one of the world's major producers of nutmeg, mace, clove, cinnamon and cocoa making it a feast for the senses. The most popular area in Grenada for hiking and trekking, this national park offers miles of trails and scenery. A small fort built by the British is located on top of Richmond Hill, with a commanding vantage point offering an amazing view of Grenada. Take a gentle stroll through the well tended gardens and wall of rock to get to this picturesque waterfall that cascades down 30 feet into a pool of water where you can take a an invigorating dip. The tranquil turquoise waters, white sand and natural setting of Morne Rouge makes this beach one of the best. This tourist town is famed for its beach located on Grenada's calm leeward south coast, packed with activities such as water-skiing, parasailing or kayaking. The gorgeous views overlooking the harbour entrance make this 18th century structure such a popular attraction today.